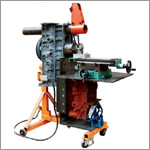 The MultiMachine is a multipurpose machine tool (a machine tool is a powered mechanical device, typically used to fabricate metal components) that a semi-skilled mechanic with just regular hand tools can build using scrap car and truck parts. Electric power is not needed. In the health sector by its use in building water pumps, filters, water well drilling rigs and hospital furnishings. In agriculture by its use in building farm machinery and irrigation pumps. In transportation by its use in building and repairing parts for vehicles. In communications by its use as as a cell phone charging station. In village life by being a source of battery power for home lighting. In education by providing vocational education students with machine tools that they build themselves and then are able to take back to their villages when they graduate. It could provide a local self supporting infrastructure that would be available to keep water and irrigation pumps in repair. Many NGOs go to great effort and expense to drill water wells and provide pumps in rural areas of underdeveloped countries. These pumps often fail because there is no person able to repair them. A small MultiMachine based business could provide a pump repairman with the means to earn a living in an area where these pumps and wells are used. The pump repairman could support himself by doing machine shop type jobs like making and sharpening agricultural tools and equipment and resurfacing vehicle flywheels, brake drums and disks. Machine tools often draw power intermittently from gas or diesel engines or electric motors. Any surplus power could run a welding machine built from a vehicle alternator and also recharge batteries that in turn could be used for home lighting or recharging cell phone batteries. bending and rolling machines that can be used to manufacture fuel efficient cook stoves, pots, pans and similar products. The MultiMachine also provides a way to machine simple zinc and aluminum castings made from the metal found in old car parts. Without this machining, the castings are of limited use but simple machining can turn them into hundreds of different kinds of products. Vocational education takes “hands on” learning. Few vocational schools in developing countries have sufficient numbers of the machine tools that are necessary for training students. This is no problem with student built MultiMachines. The plans below go into detail about constructing a MultiMachine.